Derailing development: A Zika virus infection (right) destroyed the layers (left) of a cultured ‘mini-brain’. Hongjun Song ignored the first email from Christopher Hadiono, a high school student hoping to spend the summer of 2013 in Song’s lab at Johns Hopkins University in Baltimore. The payoff didn’t seem worth the paperwork, not to mention the hassle of helping the 16-year-old New Yorker find housing for three months. “My thought was, okay, let’s just wait. If he is serious, he’s going to ask me again,” says Song, professor of neurology. Two emails, a letter and a phone call later, Song knew Hadiono was serious. He filled out the paperwork and arranged for Hadiono to stay in the school’s dormitory. He thought the high school student would help with the odd experiment. What happened next was a complete surprise. Within weeks, he had mastered computer software for making machine parts using a three-dimensional (3D) printer. By the summer’s end, he had built a device that could grow hundreds of brain organoids, or ‘mini-brains’ — spheres of cells that mimic the layers of neurons in a human brain. Less than four months later, those mini-brains were ready for analysis. “I was shocked,” Song says, recalling the moment he saw the machine whirring on top of a workbench. The machine functions like a miniature bioreactor, a device that delivers nutrients to cells and keeps them at an ideal temperature for growth. The custom-made contraption, which costs roughly $400, can accommodate more than twice as many mini-brains as $2,000 commercially available versions — and its small size and low cost allows researchers to run many of the devices in parallel. The new machine can also expose organoids to about twice as many different experimental conditions — different drugs or small molecules, for example — as are allowed by traditional bioreactors. So far, Song and his team have used the mini-bioreactors to reveal how the Zika virus tampers with the developing fetal forebrain1. They showed that the virus causes a small head size, known as microcephaly, by killing neural stem cells and thinning brain structures during the second trimester. These findings, along with blueprints for the bioreactor, dubbed SpinΩ, are outlined in a paper published 21 April in Cell1. The team has also filed for a provisional patent. The mass production of mini-brains could be a boon for drug development, enabling the simultaneous testing of different drugs to assess their effects on brain function. “The great advantage to this protocol is that it will allow much more rapid screening and assays to better study neurodevelopment in various neurodevelopmental disorders and to screen for drug targets,” says Erik Ullian, associate professor of ophthalmology and physiology at the University of California, San Francisco, who was not involved in the work. But some researchers say the new tool needs additional testing before it replaces conventional bioreactors in the lab. It’s been about five years since scientists first created mini-brains. The process involves coaxing cells from a person’s skin or other tissue to form induced pluripotent stem (iPS) cells, and then transforming the stem cells into neurons. Researchers grow the neurons in liquid, where the cells naturally clump together as they grow. The researchers then add growth factors needed for the development of tissue layers in the human forebrain. Mini-brains offer a convenient platform to test new drugs for neurological conditions as well as hypotheses about the origins of autism. But these ‘brains’ are difficult to grow. Researchers have refined mini-brain production using protein-rich gels and various chemical soups that lead to more realistic renditions of the brain. SpinΩ is an attempt to scale up studies of these organoids. One secret of SpinΩ is the tiny amounts of reagents it needs. The device requires just 2 milliliters of nutrient-rich broth in each well of a standard 12-well cell-culture plate — compared with about 120 milliliters in each glass flask of a commercial bioreactor. Small spinning pegs (one in each well) replace the large magnetic stir bar used to stir the broth. Researchers can simultaneously steep as many as 20 balls of brain tissue per well in oxygen and nutrients as they grow and mature. These devices — the pegs, gears and culture plate — are small enough to stack three high and still fit inside a mini-fridge-sized incubator, enabling close to a thousand mini-brains to grow at once. Only the size of the incubator limits the number of plates that could be stacked, Song says. By contrast, a commercial bioreactor can accommodate up to five glass flasks and can reliably grow a total of 100 mini-brains. The SpinΩ mini-brains grow for about 100 days and survive twice that long, which is similar to cell survival in a conventional bioreactor. Song currently has about 13 mini-bioreactors humming away in his lab, many of them home to iPS cells from people with autism. He plans to use the organoids they produce to uncover how autism-linked mutations affect brain development. Do neurons travel to the wrong brain layers in people with autism? Do the neurons make faulty connections? 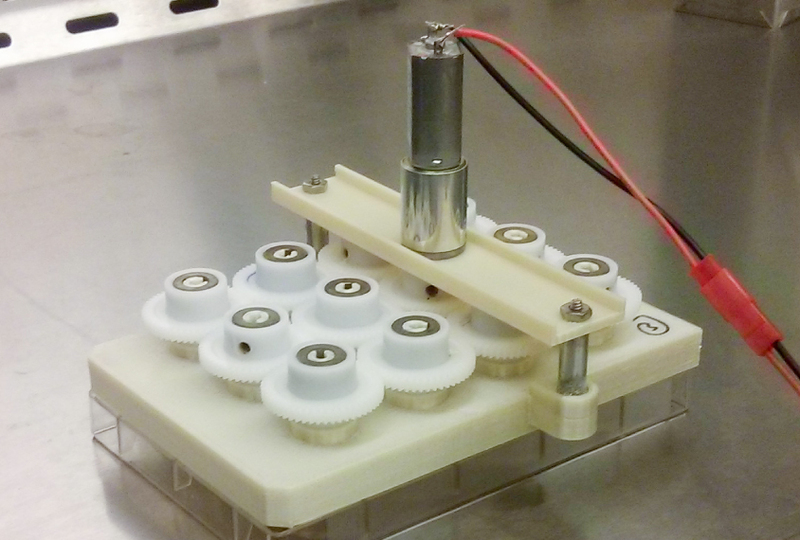 The student-made machine has piqued the interest of prominent stem cell scientists. Another mini-brain maverick, Sergiu Pasca, echoes Südhof’s sentiment. “The elegant work is a really important advance in the field of 3D brain cultures,” says Pasca, assistant professor of psychiatry and behavioral sciences at Stanford University. Despite her enthusiasm for the new contraption, Vaccarino would like to see more data showing how realistic the resulting mini-brains are. By day 54, the spheres emerging from SpinΩ contain regions resembling those found in the prefrontal cortex, a brain region involved in cognition, of a 9-week-old fetus. By day 100, they are similar to a 35-week-old fetus. But Vaccarino does not know whether the cellular layers contain neurons in biologically relevant numbers. She would also like to see stronger evidence that the stem cells differentiate into neurons that communicate using the chemical messenger gamma-aminobutyric acid (GABA), which is implicated in autism. After a successful summer in Song’s lab, Hadiono went back to high school in New York and is now studying engineering at Case Western Reserve University in Ohio. But Song quickly sought to fill the void with a new batch of teenage talent. High schoolers, he says, offer skills and perspective that can be hard to find among adults. Song now hosts at least three high school students each summer alongside a steady crew of graduate students, postdocs, technicians and young research faculty. He says each group has a different mindset when it comes to innovation. Graduate students and techs are eager to master existing protocols. Postdocs are even more risk averse, feeling pressure to produce and find a job. Vaccarino sees that kind of youthful “outrageous” thinking in SpinΩ. She points out that high schoolers who sign up for a summer at the bench instead of the beach tend to be smart, enthusiastic and driven. “They get ideas that post-docs and more senior scientists either don’t have or don’t really push through,” she says. Song says he feels sad every time he has to say goodbye to one of these young prodigies. But one high school scientist will be particularly hard to let go: his son Max, now a senior at River Hill High School in Clarksville, Maryland. Max worked with his dad last summer and part-time during this school year, and is an author on the Cell paper. Max will soon be a freshman at Brandeis University in Waltham, Massachusetts, but Song’s daughter Maggie will start high school in a couple of years.